HONG Kong's biggest protest for nearly a decade has packed the former British colony's streets in a defiant reception for its new leader and a show of popular anger after 15 years of Chinese rule. The rally came after Leung Chun-ying, a millionaire property consultant seen as close to China's communist authorities, was sworn in as chief executive in front of Chinese President Hu Jintao - who had his speech interrupted on Sunday. Hu's visit and Leung's inauguration have become focal points for growing discontent towards Beijing, which has surged to a new post-handover high amid soaring housing costs, limited democracy and perceived meddling by China. "Hong Kong has become much worse off," Eric Lai of the Civil Human Rights Front told the marchers. "Our rights are under serious threat." Organisers put the crowd at 400,000, their largest claimed turnout for eight years. In sweltering heat the last of the marchers reached their destination almost six hours after the first set out, and along the way they blocked streets far across the city, stranding buses and trams as they surrounded them. 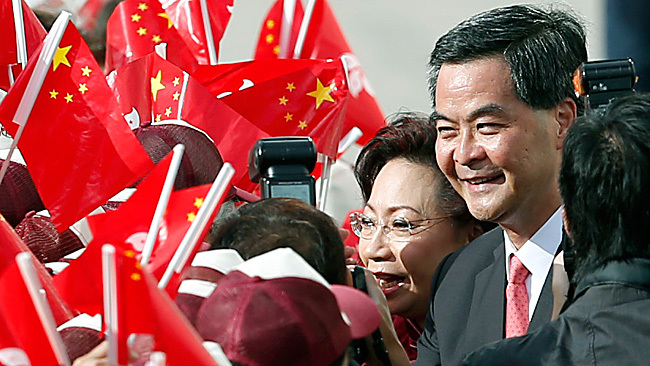 Hong Kong does not yet choose its leader by universal suffrage, and Leung was elected as chief executive in March by a committee stacked with pro-Beijing business elites. A spokesman for the Hong Kong government said it "fully respected" freedom of expression and the right to "take part in processions", and would listen to the demonstrators' views "in a humble manner". Earlier, as President Hu began his speech to around 2300 guests at Leung's inauguration, a protester inside the harbour-front venue repeatedly shouted "End one-party rule". The man also referred to the Tiananmen Square protests of 1989 in Beijing, and was rapidly bundled away by security personnel, while the audience drowned him out with extended applause for Hu. Beijing's support for "one country, two systems" and the right of Hong Kongers to rule the territory was "unwavering", said Hu. "We will follow the Basic Law ... to continue to advance democratic development in Hong Kong," said the president, who will step down as part of a once-in-a-decade leadership transition in Beijing starting later this year. 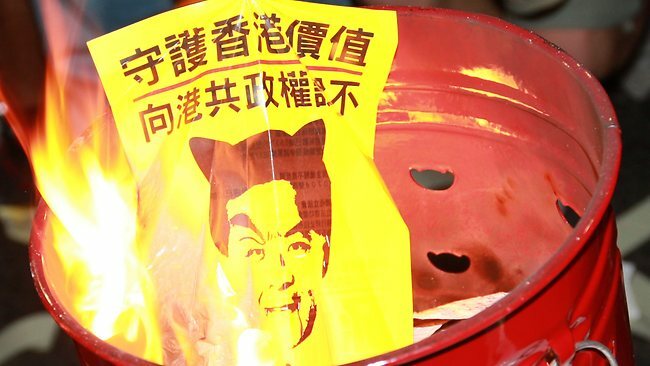 Late on Sunday some 300 protesters held a demonstration outside the Beijing representative office in Hong Kong, burning copies of the city's mini-constitution before dispersing around midnight.